"" What's She Eating Now? : Sommeliers at Burger King? Saw this on Eater who found it on Flickr. Personally, I think Dr. Pepper may pair better with the Tendergrill Salad than Diet Coke but the beauty of soft drinks is to each his own, with refills. They have it all wrong. 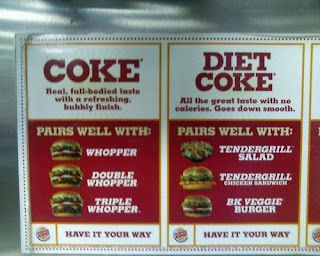 The classic pairing is the triple Whopper with extra bacon, extra bacon grease, king-sized fries, and a Diet Coke.